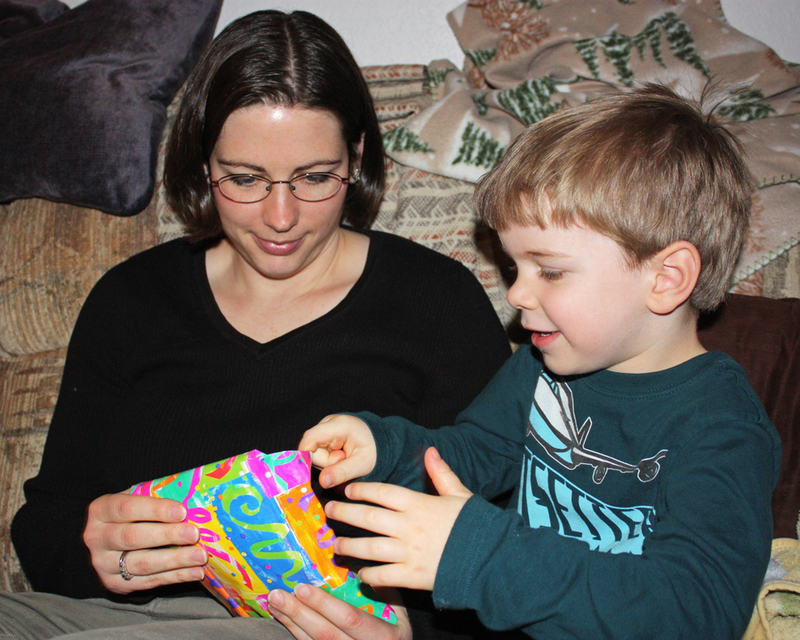 On Saturday we had birthday with my parents. Or mostly we spent the day with them. 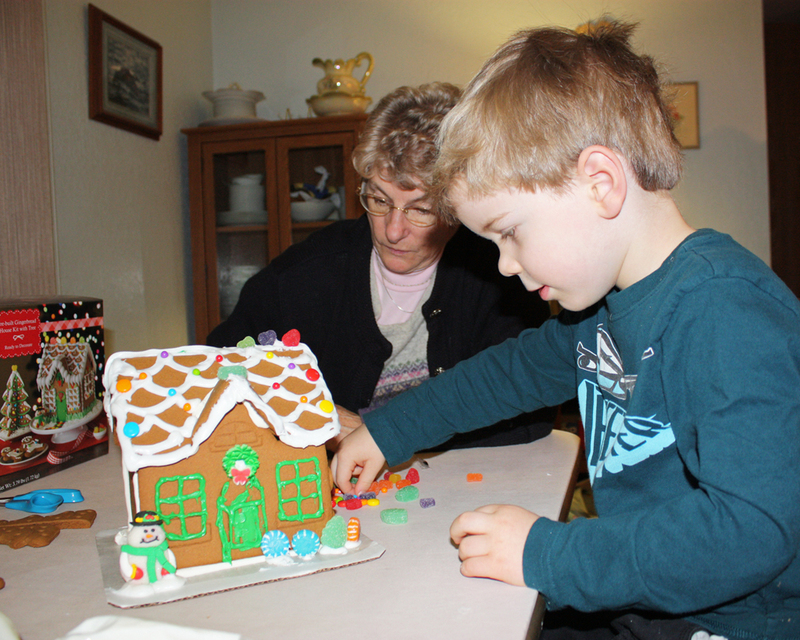 Nana had a gingerbread house for Cory to decorate. I think this is going to be a tradition! He was oh so tempted to eat the candy, but we told him it was not for eating being who knows how old. Besides, Nana has all kinds of other treats at her house so it's not like he was missing out! He did a fabulous job of decorating this year. Directing me as to where I should put the icing so he could add the candies! 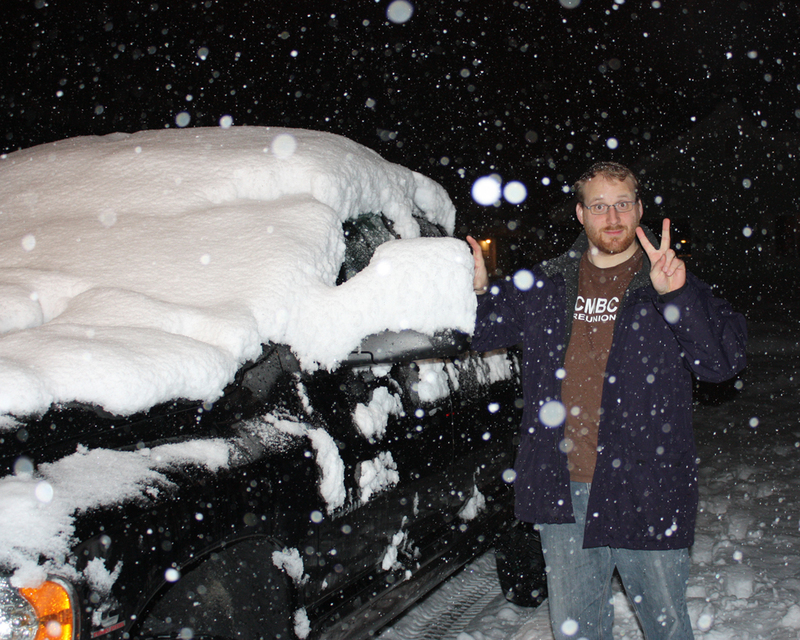 Then we rushed and put our snow clothes on (except I forgot my snow pants... big mistake!) and walked towards downtown to see if we could make it for the Christmas Lighting (those of you who know where I grew up know how crazy this is!). As we were walking people were coming towards us so I knew we had missed it, but we pressed on to see all the lights anyway. It was snowing like CRAZY and enough was piled up where people hadn't walked that it was over the tops of my boots. 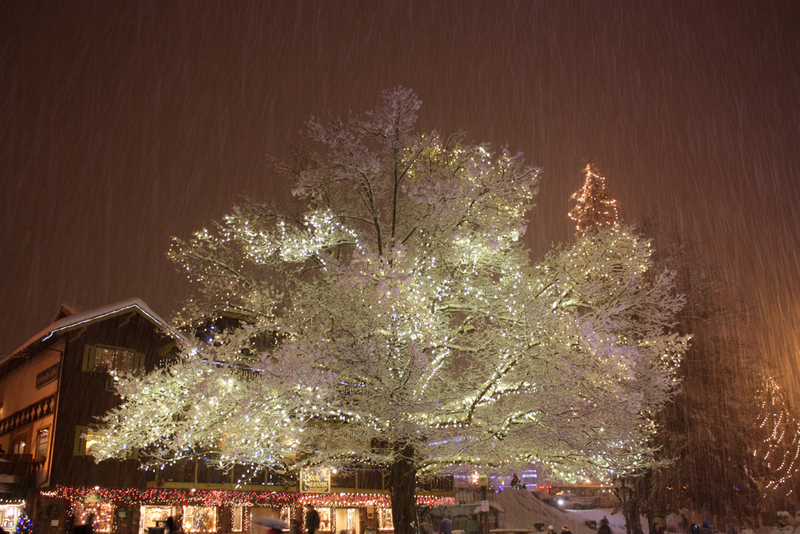 You can see the snowflakes falling in this slow shutter speed shot. 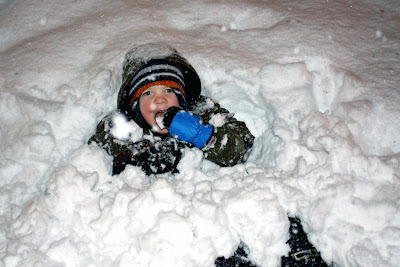 We did walk around downtown, visit a couple of shops and then on the way home I threw Cory in the snow bank and tried to "bury" him a few times. He loved it! It took us much longer to get home with all the playing in the snow, but it was so fun! My pants were thoroughly soaked as this was definitely snowball snow, none of that light fluffy stuff, this was thick and wet... all 14 inches of it! Dinner was fresh halibut my brother and dad caught this fall as well as a salmon from one of their buddies. 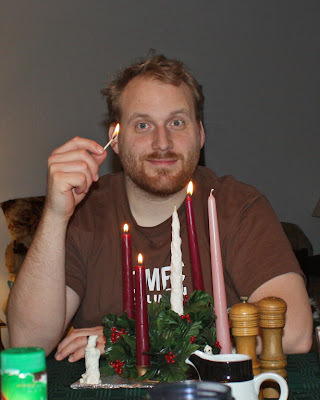 The lighting of the Advent wreath. 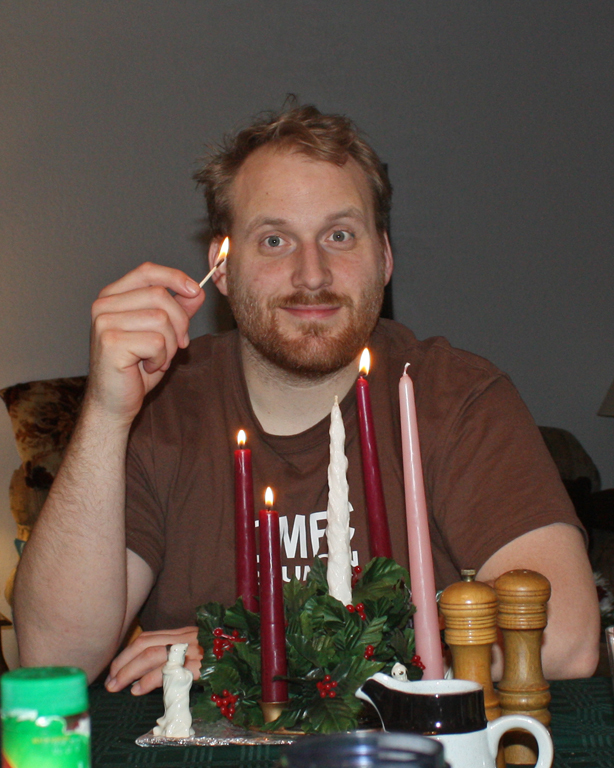 Otherwise known as playing with fire. 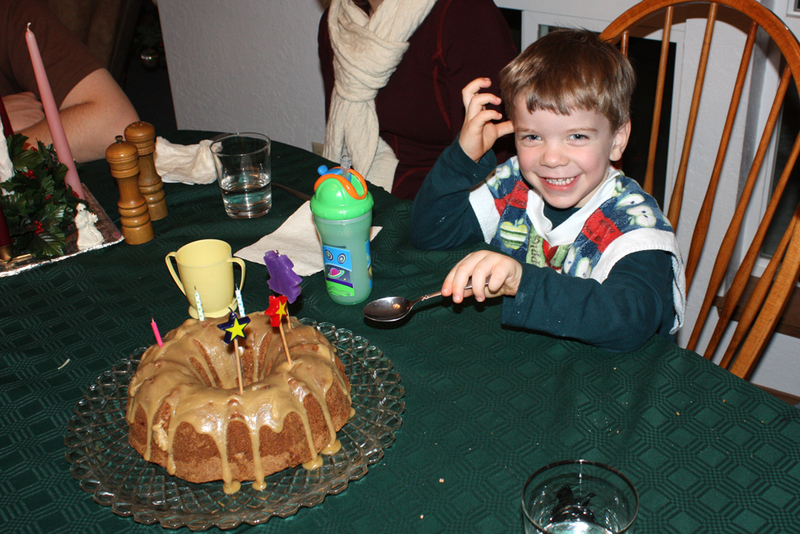 Mom brought out the cake and Cory was gung-ho to dig right in with his spoon! 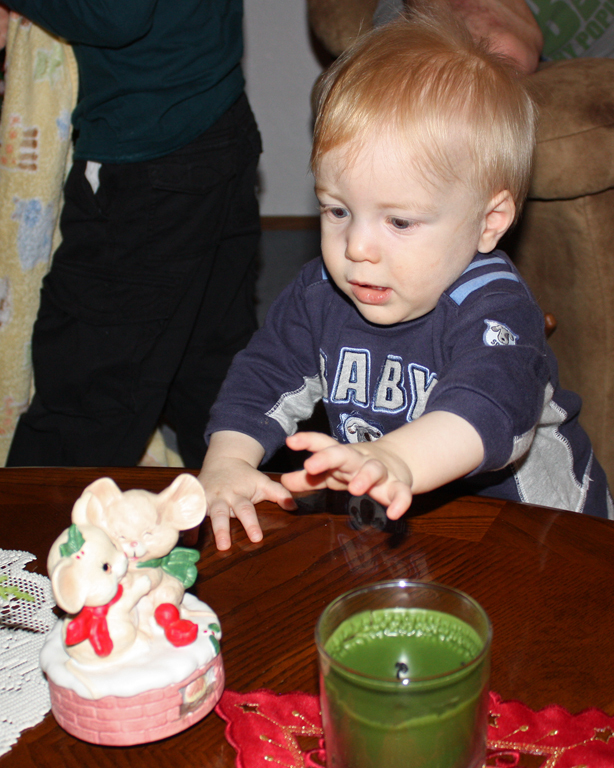 He did help me blow out the candles since it was his 3 candle on it as well! The boy has birthdays figured out... but he wants to be in the thick of it! 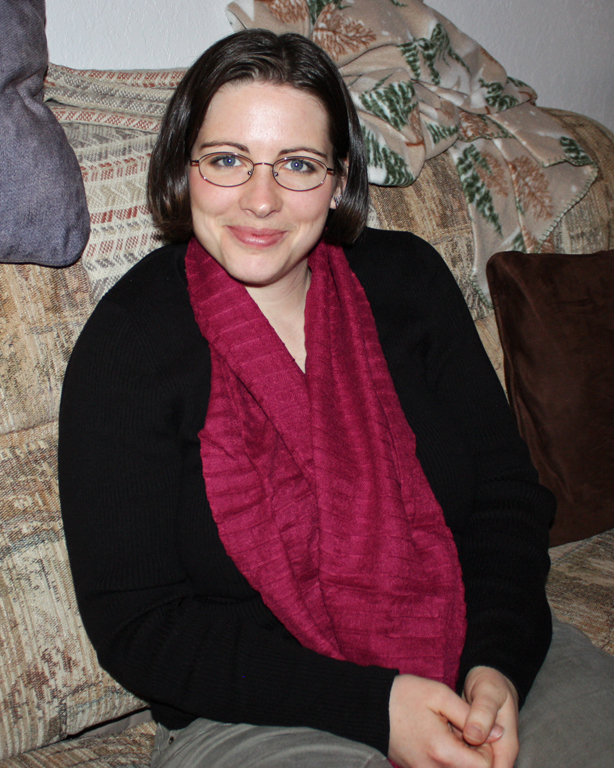 So he opened helped me open my present from my brother... this very pretty raspberry scarf! 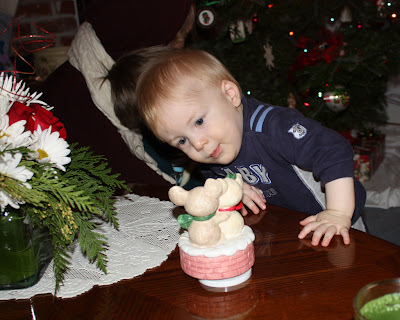 While we were then just hanging out Noah was fascinated by this little mouse music box on the coffee table. You wind it up and the whole thing turns. He was following it with his head and so interested! He wanted to touch it, but I said "no no" and he pulled his hand back. I'm so proud of him for listening! Completely intrigued! It kept his attention for a good 5 or 10 minutes as long as I kept winding it up! What this picture represents is between 2 and 3 hours of snowfall on my brother's truck...the time we were eating dinner. 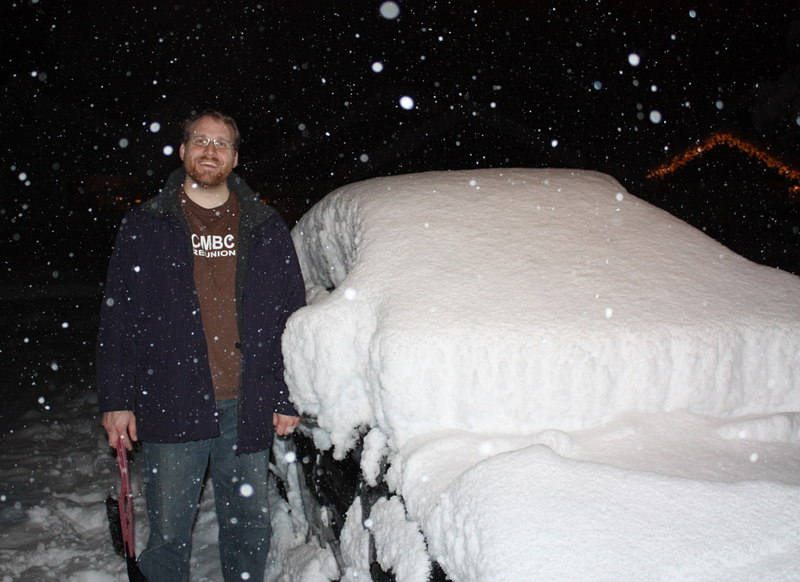 And this is the accumulated snowfall from the day on my parent's Jetta... is there even a car under there? As for the movie... it was a good movie in it's own right although we were a bit disappointed that they had to "Hollywood-ize" it by adding a big battle scene and some other things that weren't in the book. None of it horrible, but if you've read the book you definitely notice. And they left out the best part about how Eustace really changes as he's a dragon. But still, I think it's worth seeing, if only for the amazing cinematography/special effects. At least that part was true to my imagination of the story! 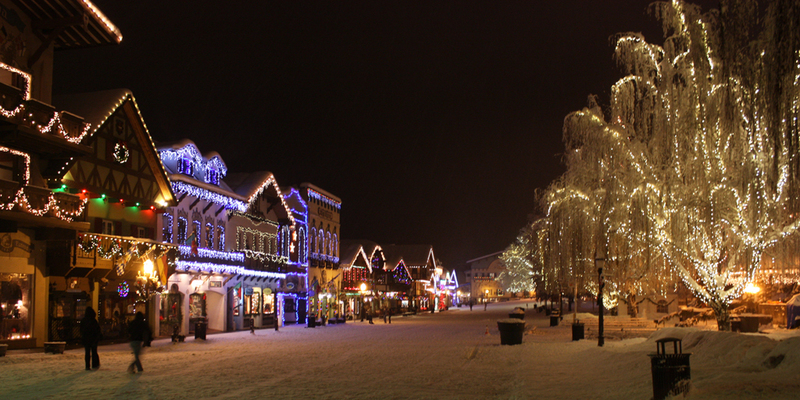 And finally at 11pm we drove back downtown to get a shot of the lights without the hordes of people. This reminds me of a story... the first time Brian ever came to visit me at home was at Christmas and he drove in at 4am. He thought I lived in a snow globe because the clouds were low, touching the mountains all around town. 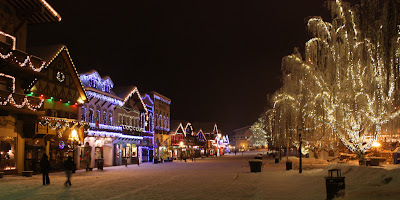 With all the lights and snow I have to admit, it's really pretty! If you've read this far, kudos! Sorry for such a long post, but it was a very full and enjoyable day! I didn't mind the length of this post at all! I LOVED it! Sounds like you had an awesome day! Thanks for sharing all of that!